Posted byJoelRieves	 April 8, 2015 Leave a comment on Celebrating Jesus? 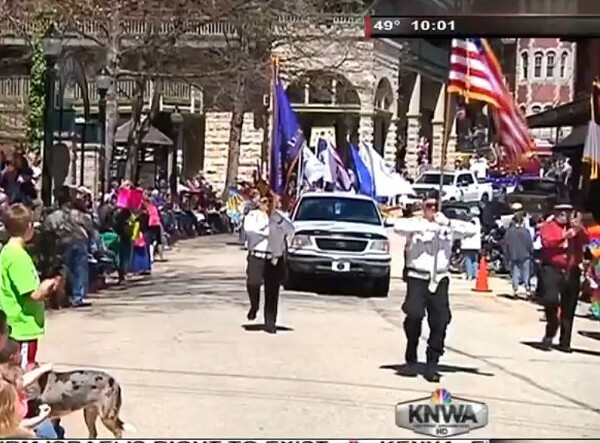 This past Saturday, the Western Carroll County Ministerial Association in Eureka Springs, Arkansas put on its 3rd annual “Celebrate Jesus” parade. Lest you think I do nothing but sit around surfing the internet for interesting stuff to write about (I do, but I don’t want you think that), this one actually fell into my lap. 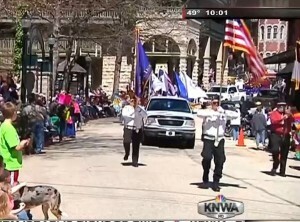 A friend shared an article that said First United Methodist Church of Eureka Springs was excluded from the parade. Why? Probably because 1st UMC is a welcoming and affirming congregation and planned on carrying a banner that read “Jesus Loves All”. Seriously, a church wanted to spread the message of God’s unconditional love? Well, we can’t have that in parade dedicated to the symbol of that love, now can we? When I first read this article, I had two questions: 1) is this real? And, 2) what the hell is a “Celebrate Jesus” parade? I posted them on Facebook and was informed in fairly short order that, yes, it was real and that it was an Easter celebration. So, you’re having a parade to celebrate a man who included everyone and hung out with hookers, tax collectors and all manner of other unsavory characters (there may even have been a lawyer or two in the bunch) by excluding people? Count me in! I know Jesus to love everyone, but that’s really hard. Besides, it’s much more satisfying to have our little private club where we determine who’s in and who’s out. Hell, if we were to let just anyone in it would cheapen the whole experience. Look, the deal is that I follow Jesus (which means I don’t drink, smoke, listen to rock and roll music, screw around or do anything fun, right? ), as a reward, I’ll get to spend eternity in Heaven. For that to have any meaning whatsoever, I have to be able to exclude certain groups of people. Right now, the group that I want to exclude are the gays. And, people who think the gays are okay. And, muslims. And, atheists. And…, oh hell, make it anyone who doesn’t believe exactly as I do. Is that so hard to understand? I’m not sure why those heathen Methodists would even want to be in a “Celebrate Jesus” parade, anyway. This parade is for people who “believe that the Bible is the uncompromised Word of God inspired by the Holy Spirit” and evidently, they think the Bible says it’s okay to be gay. Boy, have they got another think coming. I mean, yeah, there’s not a single recorded instance of Jesus saying anything about gay stuff. And, the few times the Bible does say anything about it are pretty murky when you take some time to understand the language and context. But, there’s a way around that: pick the verses that say what you want them to say and ignore the rest. The whole “Jesus never said” part is a little tricky, though. What I like to do is take some of the verses about marriage and twist them to mean what I want. Sure, it feels a little dirty at first, but you get used to it (after your soul builds up enough calluses, you don’t notice). I know this whole thing comes off as hypocritical. I mean, we’re talking about a parade to celebrate a guy who preached against showy religious displays and all. But, he also said for us to “make disciples of all nations” and how are we going to do that without flashy things like parades and multi-million dollar mega churches? You know what they say, you can’t make an omelet without breaking a few eggs. Is it our fault if the eggs we have to break are the ones we don’t like?